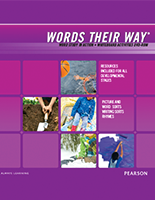 Palabras a Su Paso: El Estudio de Palabras en Acción (Words Their Way: Word Study in Action) is a powerful word study approach to teach phonics, spelling and vocabulary in Spanish. The ready-to-use format is ideal for native speakers of Spanish who are learning in their first language, or Spanish learners in immersion settings. Palabras a su paso is a hands-on approach to Spanish word study that teaches students to look closely at words to discover letter-sound correspondences, spelling patterns, syllable stress system, and spelling-meaning connections of Spanish orthography. Students learn to examine, manipulate, and categorize words while focusing their attention on the critical features of the words - their sound, spelling, and meaning. 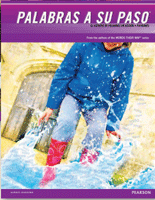 Palabras a su paso is based on Spanish orthographic principles. 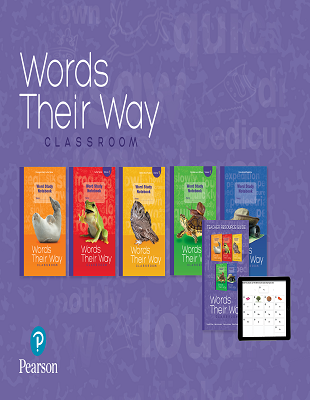 However, because Palabras a su paso parallels the Words Their Way Word Study in Action instructional approach, teachers in bilingual settings will find that having both English and Spanish versions of this word study program make dual-language classroom management more coordinated and productive. Gran libro de rimas (Big Book of Rhymes, first 3 stages): The ​Big Book ​includes poems aligned to the sorts in the Emergent-Early Letter Name, Letter Name, and Within Word Pattern stages ​and is​ used to introduce the sort.